WASHINGTON (JTA) – President Barack Obama’s near parting gift to Israel, a guarantee of $38 billion in defense assistance over a decade, distills into a single document what he’s been saying throughout eight fraught years: I have your back, but on my terms. 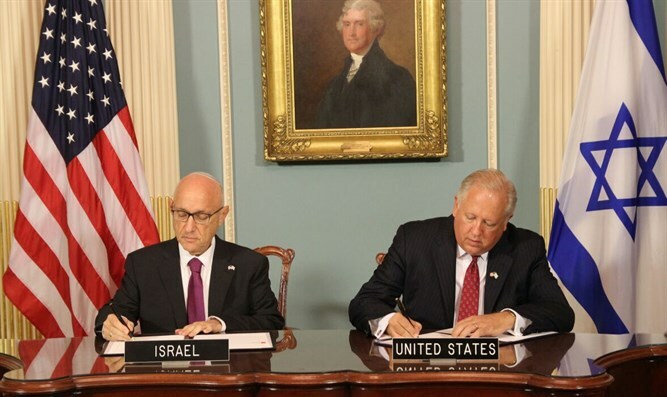 The agreement signed Wednesday in the State Department’s Treaty Room here increases assistance for Israel over the prior Memorandum of Understanding signed in 2007 under the George W. Bush administration and guaranteeing Israel $31 billion over 10 years. But it also substantially shrinks the role Congress plays in a critical forum shaping U.S.-Israel relations, defense assistance, and in so doing diminishes the influence of the mainstream pro-Israel community, a sector that at times has been an irritant to Obama. Wrapped into the $38 billion memorandum is $5 billion in missile defense funding, with clauses placing tough restrictions on Israel's ability to ask for supplements from Congress. Under Obama and Bush, that’s been an arena where the pro-Israel lobby has flexed its muscle over the last decade or so, consistently asking Congress for multiples of the missile defense appropriations requested by each president – and getting it. Democrats in Congress praised the deal unequivocally, but Republicans had caveats. Rep. Ileana Ros-Lehtinen, R-Fla., the chairwoman of the U.S. House of Representatives subcommittee for the Middle East, led passage of a congressional resolution urging an extension of the defense assistance – coincidentally, just hours after the sides announced a deal was in the offing on Monday. Ros-Lehtinen said she intended to subject the agreement to congressional scrutiny. “It is important for Congress to conduct its oversight authority and examine the MOU closely in order to ensure that this agreement is mutually beneficial and meets the needs of both the U.S. and Israel,” she said in a statement. Sen. Lindsey Graham, R-S.C., the chairman of the Senate Appropriations Committee’s subcommittee dispensing foreign aid, was infuriated by the arrangement. “We can’t have the executive branch dictating what the legislative branch will do for a decade based on an agreement we are not a party to,” he told The Washington Post this week, and pledged to push more funds for Israel through Congress. Jacob Nagel, the acting Israeli national security adviser who led talks ahead of the agreement, told reporters on Wednesday, before the formal signing, that the Israelis had asked Graham to back off. Indeed, written into the agreement is Israel’s pledge to return to the U.S. government any extra monies that Congress approves on top of the memorandum before it kicks in, October 2018. There is an exception for requests for emergency assistance in the event of "major conflicts," and Nagel noted that the Obama administration has provided such additional assistance quickly. There are other rollbacks in the deal demanded by Obama and his team, headed by Susan Rice, the national security adviser. Israel is currently the only country allowed to spend some of its defense assistance – up to 26 percent – on its own defense industries. That will be phased to zero by the end of the agreement, and all funding will be spent on U.S. suppliers and contractors. Obama resented having to deal with intercessors in Congress and in parts of the pro-Israel community over his two terms when he clashed with Israel on critical issues like Israeli-Palestinian peace and the Iran nuclear deal. Pitching the Iran deal in an August 2015 speech at American University, he referred derisively to critics who called the deal a “historic mistake,” assailing their “credibility.” Republicans in Congress and officials at the pro-Israel lobby AIPAC understood that they were the targets. Those wounds were not entirely healed, as evidenced by Rice’s comments at the signing. The memorandum, the Iran deal and the 2013-14 Obama administration push for an Israeli-Palestinian peace deal were all part of the same commitment “to Israel’s security over the long term,” Rice said. Left unsaid was how unhappy Israel was with both initiatives. Just months before Obama leaves office, the memorandum narrows the spectrum of the U.S.-Israel relationship to the two countries' executive branches, a posture that could benefit Hillary Clinton, whom Obama hopes will succeed him as president. Clinton’s presidential campaign praised the deal. “The agreement will help solidify and chart a course for the U.S.-Israeli defense relationship in the 21st century as we face a range of common challenges, from Iran's destabilizing activities to the threats from ISIS and radical jihadism, and efforts to delegitimize Israel on the world stage,” the campaign's statement said. A JTA request for comment on the memorandum from the campaign of Donald Trump, the Republican presidential nominee, was not answered. Ron Dermer, the Israeli ambassador to Washington who helped shape the agreement, said Obama’s imprimatur made it clear that the relationship had the backing of the U.S. political spectrum following two years of tensions between the government of Prime Minister Benjamin Netanyahu and the Obama administration. “It shows that the strength of the relationship is in being able to weather disagreements,” Dermer said. Alan Solow, a longtime Obama backer and a past chairman of the Conference of Presidents of Major American Jewish Organizations, said the deal should make it clear that Obama, contra his critics, always valued the relationship and the strategic assets Israel brought to it. The group that was at the forefront of the Iran battle, the American Israel Public Affairs Committee, lauded the agreement. Jonathan Greenblatt, the Anti-Defamation League CEO who attended the signing, said the stability of the agreement in a volatile Middle East outweighed whatever political price pro-Israel groups might pay.